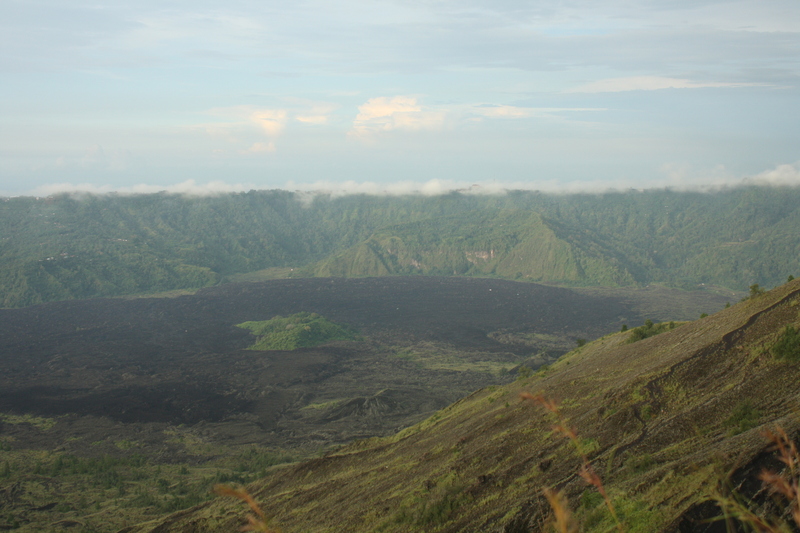 One of the must do activities, or so I’ve heard, in Bali is to climb one of the few volcanoes. And when you do this climb is quite different than any other hike you have done before. You begin your ascent at 4 AM in the morning. Yes, you are in complete darkness, with no promise of light until you are at the top. This is no easy feat. Especially since I haven’t worked out in almost a year (thank you Southeast Asia!). 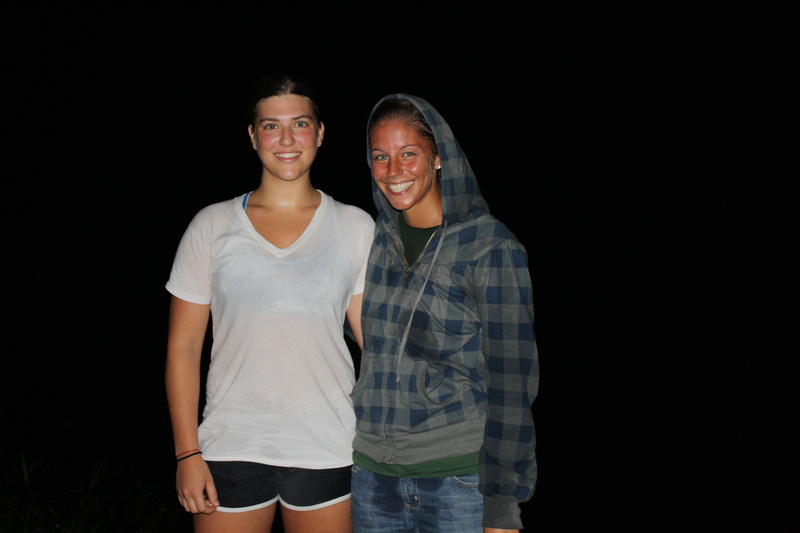 My friend Stephanie and I began our trip to Mount Batur (there are also a few other volcanoes, but this one seems to be the more popular one, I think its because its an “easier” climb and its shorter than the others) at 2 AM from Kuta Beach. We attempted to nap on the way up to the volcano, but struggled to gain some extra shut eye before our adventure up the mountain. We arrived at the base and met our guide, Pon, who ended up being the best guide ever, but more on that later. For awhile, it was pretty flat. We had no idea what the terrain looked like around us or ahead of us. I felt like I was going straight up…all the time…with no end. Holding the extremely small flashlight I was given, I carefully maneuvered the rocks and hoped that I didn’t fall, which I didn’t, but definitely came close once or twice! It felt so great to be breaking a sweat (well, Southeast Asia makes me sweat all the time, but this sweat wasn’t from heat! ), but I had to put the hood up on my sweatshirt because the breeze was making me cold. I had to take many breaks and after a great deal of huffing and puffing, we made it to the top and we were the first ones there! We felt extremely accomplished and it had only taken us a little over an hour when it is supposed to take an hour and a half or so. We soon were freezing because our completely sweat drenched bodies were now feeling the cold of the mountain top and we were eager for the sun to rise. Our adrenaline must have kicked in as well because we were soon laughing and making jokes and might have been “those girls” at the top, but we didn’t care, we just climbed a volcano! Soon enough, the sun peeked out from behind the mountains, and although it was quite cloudy, it was still definitely worth it. We enjoyed the sunrise and then took a quick walk around the crater, but didn’t get too close because a Swedish man had fallen in only a few days earlier. I’m not exactly sure how he fell in, he had to have been doing something pretty stupid to lose his balance, but who knows (the Grand Canyon has roughly 10 photography related deaths a year so I’m not entirely surprised)! On the way down (which sometimes is harder than the way up! ), it was really fun to actually see what we missed in the morning! The mountainside was covered in black lava rocks from previous eruptions, (oh and by the way this volcano is still active, yeah it could have blown at any second) and the views were amazing! 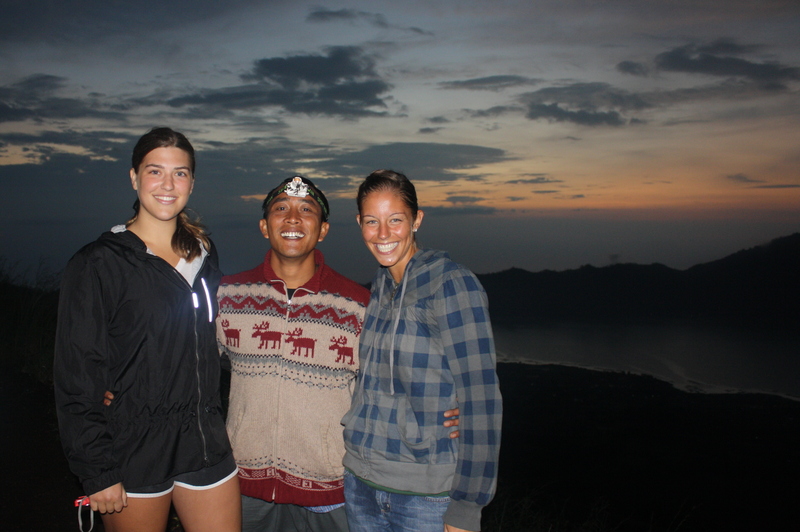 Our guide apparently loved us as well and gave us our very own Mt. Batur Trekking Guide shirts!! You can’t buy those! We were ecstatic!! Climbing Mt. 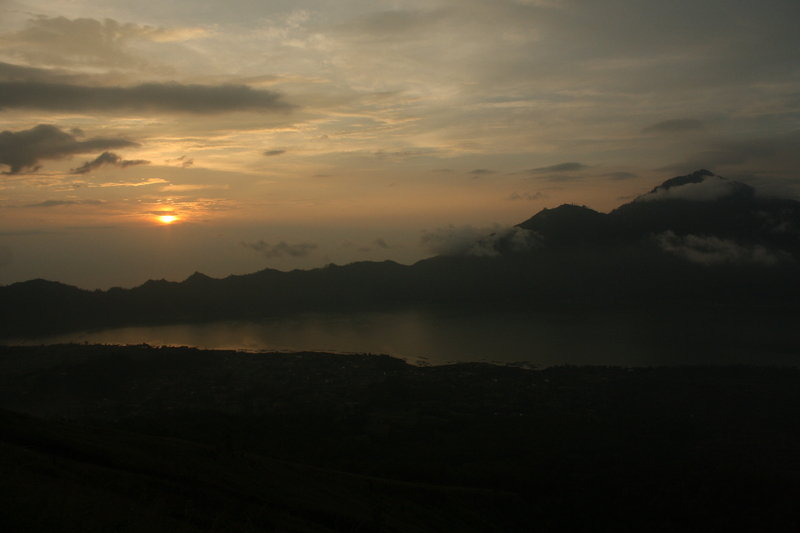 Batur at night has been one of my favorite activities yet on my travels! Glad you’re alive. Was getting worried after not seeing a post for a while knowing that you were in Thailand during all the violence. Sounds amazing! It must have been a long trip if you had to start before the sun came up. Whenever I read posts from people who are in warm climates, I question my decision to stick around Queenstown for the winter! Thanks for sharing. Great blog! I would have been ‘one of those girls’ at the top of the mountain too. You earned it. sounds fun. 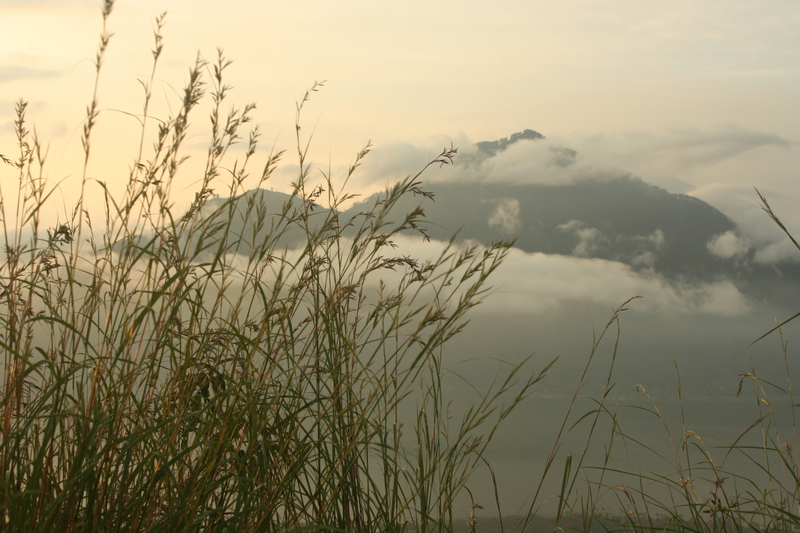 i am thinking of climbing mt batur too… and it seems that you really loved your guide. do you still have his contact info?